This article is for users new to Power BI Desktop. It’s meant to give you a quick and easy introduction on how you can use Data Analysis Expressions (DAX) to solve a number of basic calculation and data analysis problems. We’ll go over some conceptual information, a series of tasks you can complete, and a few quizzes to test what you’ve learned. After completing this article, you should have a good understanding of the most important fundamental concepts in DAX. It’s quite easy to create a new Power BI Desktop file and import some data into it. You can even create reports that show valuable insights without using any DAX formulas at all. But, what if you need to analyze growth percentage across product categories and for different date ranges? Or, you need to calculate year-over-year growth compared to market trends? DAX formulas provide this capability and many other important capabilities as well. Learning how to create effective DAX formulas will help you get the most out of your data. When you get the information you need, you can begin to solve real business problems that affect your bottom line. This is the power in Power BI, and DAX will help you get there. We’re going to focus on understanding DAX formulas used in calculations, more specifically, in measures and calculated columns. 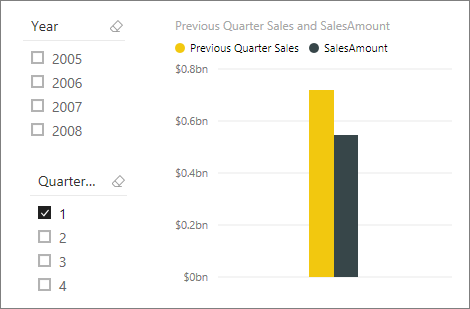 You should already be familiar with Power BI Desktop, importing data, adding fields to a report, and you should also be familiar with fundamental concepts of Measures and Calculated columns. The best way to learn DAX is to create some basic formulas, use it with some actual data, and see the results for yourself. The examples and tasks here use the Contoso Sales Sample for Power BI Desktop Preview file. This is the same sample file used in the Tutorial: Create your own measures in Power BI Desktop article. Here is the sample file to download. We will frame our understanding of DAX around three fundamental concepts: Syntax, Functions, and Context. Of course, there are other important concepts in DAX, but understanding these three concepts will provide the best foundation on which to build your DAX skills. Before you create your own formulas, let’s take a look at DAX formula syntax. Syntax includes the various elements that make up a formula, or more simply, how the formula is written. For example, let’s look at a simple DAX formula for a measure. A. The measure name Total Sales. B. The equals sign operator (=) indicates the beginning of the formula. When calculated, it will return a result. C. The DAX function SUM adds up all of the numbers in the Sales[SalesAmount] column. You’ll learn more about functions later. D. Parenthesis () surround an expression containing one or more arguments. All functions require at least one argument. An argument passes a value to a function. E. The referenced table Sales. F. The referenced column [SalesAmount] in the Sales table. With this argument, the SUM function knows on which column to aggregate a SUM. When added to a report, this measure calculates and returns values by summing up sales amounts for each of the other fields we include, for example, Cell Phones in the USA. You might be thinking ‘Isn’t this measure doing the same thing as if I were to just add the SalesAmount field to my report?’ Well, yes. But, there’s a good reason to create our own measure that sums up values from the SalesAmount field: We can use it as an argument in other formulas. This may seem a little confusing now, but as your DAX formula skills grow, knowing this will make your formulas and your model more efficient. In fact, you’ll see the Total Sales measure showing up as an argument in other formulas later on. Let’s go over a few more things about this formula. In particular, we introduced a function, SUM. Functions are pre-written formulas that make it easier to do complex calculations and manipulations with numbers, dates, time, text, and more. You will learn more about functions later. You also see the column [SalesAmount] was preceded by the table Sales in which the column belongs. This is known as a fully qualified column name in that it includes the column name preceded by the table name. Columns referenced in the same table do not require the table name be included in the formula. This can make long formulas that reference many columns shorter and easier to read. However, it's good practice to include the table name in your measure formulas, even when in the same table. If a table name contains spaces, reserved keywords, or disallowed characters, you’ll need to enclose the table name in single quotation marks. You’ll also need to enclose table names in quotation marks if the name contains any characters outside the ANSI alphanumeric character range, regardless of whether your locale supports the character set or not. It’s important your formulas have the correct syntax. In most cases, if the syntax is not correct, a syntax error will be returned. In other cases, the syntax may be correct, but the values returned might not be what you are expecting. The DAX editor in Power BI Desktop includes a suggestions feature, used to create syntactically correct formulas by helping you select the correct elements. Let’s create a simple formula. This task will help you further understand formula syntax and how the suggestions feature in the formula bar can help you. To complete this task, you’ll need to open the Contoso Sales Sample Power BI Desktop file. In Report view, in the field list, right-click on the Sales table, and then click New Measure. In the formula bar, replace Measure by typing a new measure name, Previous Quarter Sales. After the equals sign, type the first few letters CAL, and then double-click the function you want to use. In this formula, you want to use the CALCULATE function. You’ll use the CALCULATE function to filter the amounts we want to sum by an argument we pass to the CALCULATE function. This is what’s referred to as nesting functions. The CALCULATE function has at least two arguments. The first is the expression to be evaluated, and the second is a filter. After the opening parenthesis ( for the CALCULATE function, type SUM followed by another opening parenthesis (. Now we need to pass an argument to the SUM function. Begin typing Sal, and then select Sales[SalesAmount], followed by a closing parenthesis ). This is the first expression argument for our CALCULATE function. Type a comma (,) followed by a space to specify the first filter, and then type PREVIOUSQUARTER. This will be our filter. You’ll use the PREVIOUSQUARTER time intelligence function to filter SUM results by the previous quarter. After the opening parenthesis ( for the PREVIOUSQUARTER function, type Calendar[DateKey]. The PREVIOUSQUARTER function has one argument, a column containing a contiguous range of dates. In our case, that's the DateKey column in the Calendar table. Make sure both the arguments being passed to the PREVIOUSQUARTER function and the CALCULATE function are closed by typing two closing parenthesis )). Click the checkmark in the formula bar or press Enter to validate the formula and add it to the model. You were just introduced to several important aspects of DAX formulas. First, this formula included two functions. Notice PREVIOUSQUARTER, a time intelligence function, is nested as an argument passed to CALCULATE, a filter function. DAX formulas can contain up to 64 nested functions. It’s unlikely a formula would ever contain so many nested functions. In fact, such a formula would be very difficult to create and debug, and it probably wouldn’t be very fast either. In this formula, you also used filters. Filters narrow down what will be calculated. In this case, you selected one filter as an argument, which is actually the result of another function. You will learn more about filters later. Finally, you used the CALCULATE function. This is one of the most powerful functions in DAX. As you author models and create more complex formulas, you will likely use this function many times. Discussing the CALCULATE function is outside the scope of this article, but as your knowledge of DAX grows, pay special attention to this one. Answers are provided at the end of this article. Functions are predefined formulas that perform calculations by using specific values, called arguments, in a particular order or structure. Arguments can be other functions, another formula, expression, column references, numbers, text, logical values such as TRUE or FALSE, or constants. Excel has a very popular function, VLOOKUP. DAX functions don’t take a cell or cell range as a reference like VLOOKUP does in Excel. DAX functions take a column or a table as a reference. Keep in mind, in Power BI Desktop, you’re working with a relational data model. Looking up values in another table is really quite easy, and in most cases you don’t need to create any formula at all. As you can see, functions in DAX can help you create very powerful formulas. We really only touched on the basics of functions. As your DAX skills grow, you'll create formulas using many different functions. One of the best places to learn details about each of the DAX functions is in the DAX Function Reference. Context is one of the most important DAX concepts to understand. There are two types of context in DAX; row context and filter context. We’ll first look at row context. Row context is most easily thought of as the current row. It applies whenever a formula has a function that applies filters to identify a single row in a table. The function will inherently apply a row context for each row of the table over which it is filtering. This type of row context most often applies to measures. Filter context doesn’t exist in-place of row context; rather, it applies in addition to row context. For example, to further narrow down the values to include in a calculation, you can apply a filter context, which not only specifies the row context, but also specifies only a particular value (filter) in that row context. Filter context is easily seen in your reports. For example, when you add TotalCost to a visualization, and then add Year and Region, you are defining a filter context that selects a subset of data based on a given year and region. To better understand this formula, we can break it down, much like with other formulas. A. The measure name Store Sales. B. The equals sign operator (=) indicates the beginning of the formula. C. The CALCULATE function evaluates an expression, as an argument, in a context that is modified by the specified filters. D. Parenthesis () surround an expression containing one or more arguments. E. A measure [Total Sales] in the same table as an expression. The Total Sales measure has the formula: =SUM(Sales[SalesAmount]). F. A comma (,) separates the first expression argument from the filter argument. G. The fully qualified referenced column, Channel[ChannelName]. This is our row context. Each row in this column specifies a channel: Store, Online, etc. H. The particular value, Store as a filter. This is our filter context. This formula ensures only sales values defined by the Total Sales measure are calculated only for rows in the Channel[ChannelName] column with the value “Store”, as a filter. As you can imagine, being able to define filter context within a formula has immense and powerful capabilities. Being able to reference only a particular value in a related table is just one such example. Don’t worry if you do not completely understand context right away. As you create your own formulas, you will better understand context and why it’s so important in DAX. Now that you have a basic understanding of the most important concepts in DAX, you can begin creating DAX formulas for measures on your own. DAX can indeed be a little tricky to learn, but there are many resources available to you. After reading through this article and experimenting with a few of your own formulas, you can learn more about other DAX concepts and formulas that can help you solve your own business problems. There are many DAX resources available to you; most important is the Data Analysis Expressions (DAX) Reference. DAX has been around for several years in other Microsoft BI tools such as Power Pivot and Analysis Services Tabular models, so there’s a lot of great information out there. You can find more information in books, whitepapers, and blogs from both Microsoft and leading BI professionals. The DAX Resource Center Wiki on TechNet is also a great place to start. Validates and enters the measure into the model.